A cairn commemorates the 1939 crossing of the Simpson Desert by Cecil Madigan and his party. 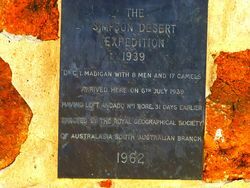 The Simpson is a sand-ridge desert extending 322 kilometres west to east, the ridges running parallel from north to south at roughly 0.4 kilometre intervals, some reaching as high as 30 metres. 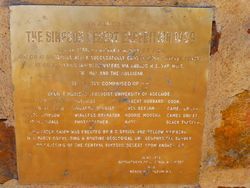 This last classic Australian exploration adventure pioneered the use of mobile radio communication; national broadcasts were made through the Australian Broadcasting Commission from desert camps. Led By Cecil T. Madigan M.A., D.Sc., B.E., F.G.S. 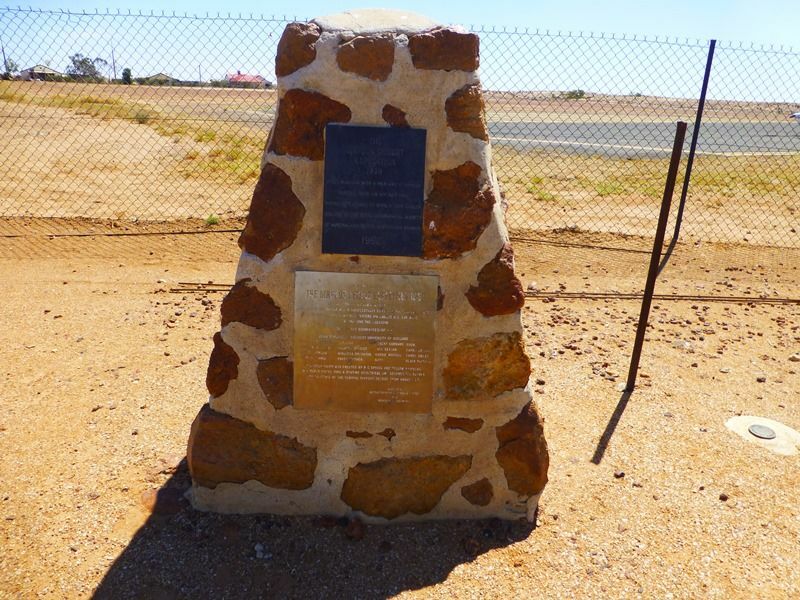 Arrived At Birdsville After Successfully Crossing The Simpson Desert By Camel From Charlotte Waters Via Andado H.S. . The Hale. The Hay And The Mulligan. Harold O.Fletcher Palaeontologist. Jack Beejah Camel Driver. Robert Simpson Wireless Operator. Noorie Moosha Camel Driver. David Marshall Photographer. Andy Black Tracker. This Later Cairn Was Erected By R.C. Sprigg And Fellow Members Of A Party Completing A Routine Geological And Geophysical Survey And Crossing Of The Central Simpson Desert From Andado H.S.